This is going to be very popular over Christmas – it’s fun for all the family! 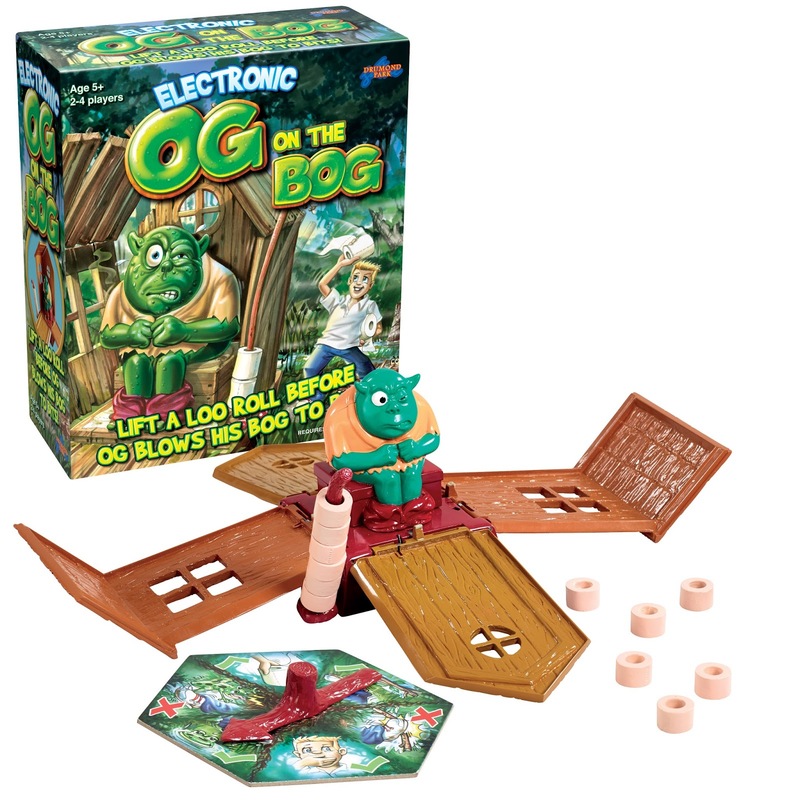 Og on the Bog is the must have family game for Christmas 2015, from Drumond Park Games. It has already been listed on the DreamToys 2015 Christmas listing. 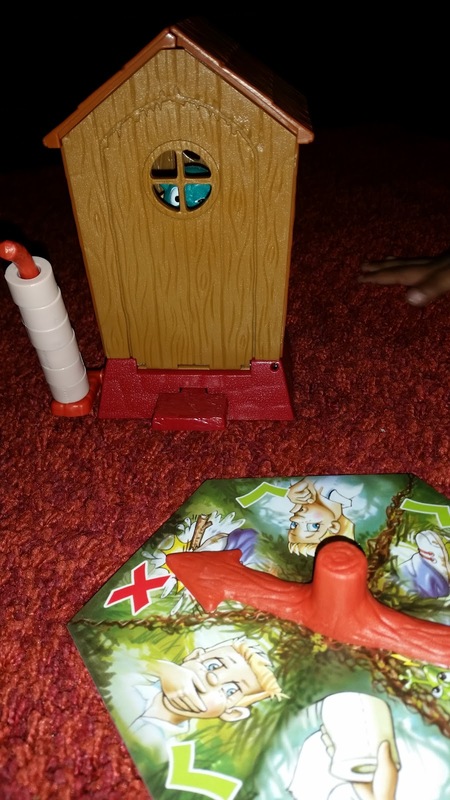 We were lucky enough to try out Og on the Bog and I’m glad we didn’t have to wait until Christmas as my boys were so eager to play it (excitement is a total understatement!). The name of the game shouldn’t been a turn off as it is a really fun game. We really enjoyed this game, it was so easy to set up and to understand. There is a tiny bit of assembly required, like putting the toilet roll handle on and you need to have 3 AA batteries. 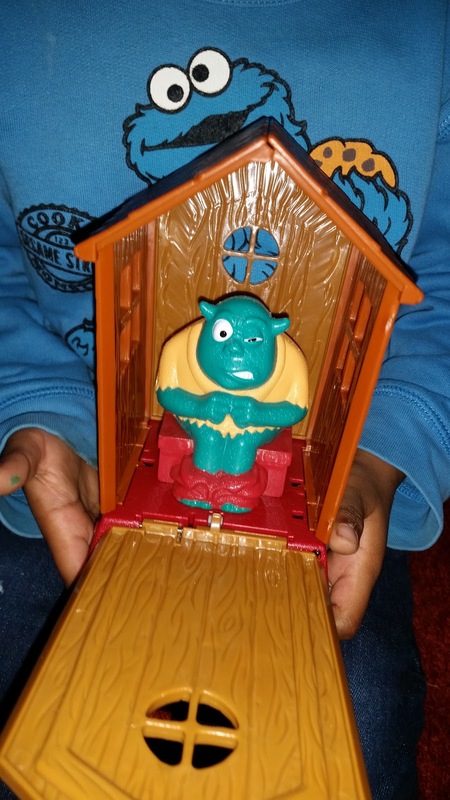 My two boys (aged 6 and 4) put it together very easily and we all loved playing and had hilarious laughs along the way. 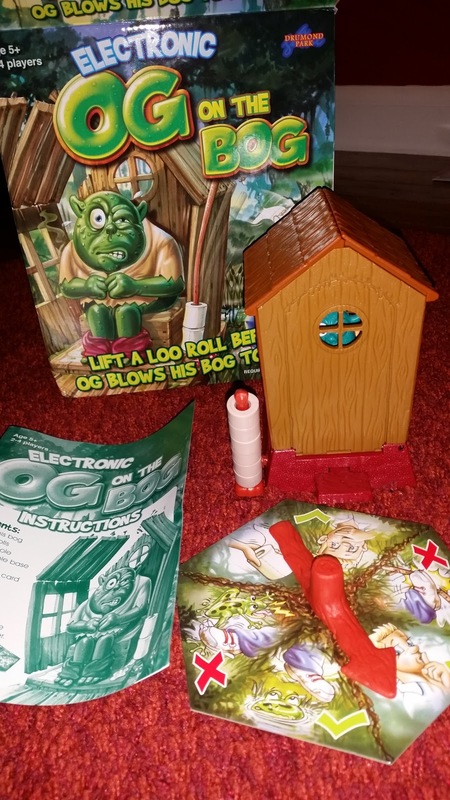 In the box you will find Og in his Bog, loo rolls, a spinner and some instructions. This game is so simple it doesn’t require much apart from some cunning loo roll stealers! Og desperately needs to have a quiet moment to finish “his business” but this is where we come into it. We need to steal Og’s loo rolls whilst he is on the bog, without him noticing. The aim of Og on the Bog is pretty simple, even for the younger ones. It’s easy to understand and there aren’t complicated rules or instruction booklets. Once you’ve assembled Og in his bog, you will hear Og snoring and sounds from the forest, where he lives. Then, starting with the youngest player you have to spin the spinner. If you land on a red cross, you miss a go, if you land on a picture of a hand on a loo roll then you can steal a roll from another player. If you land on a green tick you can sneak up on Og. You have to be careful here, as when you sneak up on Og, you have to press the button at the base of Og’s Bog and if you hear him saying stuff (things like, leave me alone / I heard something etc) your go has ended and it’s the next person’s go. If you press the button and you hear Og farting or grunting this is where you can carefully steal a loo roll. You have to be extremely careful taking the loo roll off as at any moment the Bog could explode and if it does you lose two of your collected loo rolls.! The winner is the first person to collect 4 toilet rolls. This is a hilarious game. The boys loved the naughty noises coming from Og and I can see why this is going to be a popular game over Christmas. We must have spent nearly two hours playing it the first time and it’s been a firm favourite in our house since then. Even when my youngest had to hand his toilet rolls back, I thought he would be upset, but he wasn’t. He was eagerly waiting for Og to fart and grunt so he could steal another loo roll. If you would like the chance to win OG on the BOG to play with your family in time for Christmas, then enter with the Gleam app below. Disclaimer: I was sent this product to review, but all opinions and views expressed are my own. Monopoly was always my favourite childhood game! I love Monopoly. I always wanted to be the hat! I always wanted to be the boot lol. I have so many fond memories of playing that game.